Devil's Crew is a crew that sails the Emerald Ocean, originally founded on the Sage Ocean. The crew is currently flying it's colors with the Sirens of the Sea. Devil's Crew first sailed on the Sage Ocean on 26 August, 2005 under the command of Captain Scardey on the Good Bream. The crew grew, and on August 29 of the same year, the crew allied with The Red Flag Armada. In November 2005, Trace took over the role of captain due to Scardey's work commitments. The crew also had a major communications boost with the addition of the crew forum. In February of 2006, Trumpet took over for Captain Trace. In late February of 2006 the off shoot Devil's Bane was commissioned by Captain Trumpet. This endeavor was lead by Captain Lukie. In April of 2007 Countrygirly was given the captaincy of Devil's Crew. On September 12th, 2008 Countrygirly passed the Captain's hat onto Talizen, and then stepped down to become a Senior Officer and Talizen's adviser. By February 2009 the captaincy had once again been taken up by Countrygirly. The Devil's Crew.... One of the oldest crews on Sage. Now HIRING! Devil's Crew....She's seen many a battle over her historic time on the Sage ocean. She's been a haven for honest pirates and crooks alike. . . . If sheer pride and desire could rule this ocean, we'd certainly be at the top. Unfortunately, too many in game and rl distractions have divided our attention, leaving our crew weak and undermanned. . . . We would love to rebuild our crew. Unfortunately, our current leaders have neither the time and/or the inclination to do so. If you're a young up and coming pirate, and would like to help rebuild our crew to glory and fame, please visit us. Fair winds, mate! Please act at all times with poise and dignity. Do not ask to borrow money from other crew members or outsiders. If when on a pillage, sea monster hunt or flotilla attack, do not treat it as an inn and try to sell or purchase goods. Keep that in the inn where it belongs. If you have a problem with the crew or a crew member in particular, send a private tell or keep it to Officer Chat. If you have a question about anything at anytime, feel free to ask. The only stupid question is one unspoken. Cabin Person: Initial rank upon joining crew. 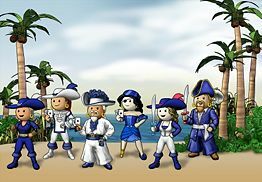 Pirate: Within 24 hours, Cabin Persons will be promoted to Pirate. Officer: Candidates need to find an existing Officer in the crew (their sponsor) and have them post an application in the Crew Forum under "Application for Officer". Candidates for Officer will need Broad experience in Bilging, Sailing, Duty Navigation, Gunnery and Carpentry. Candidates will also need to interact with the crew and be willing to help Pirates and Cabin Persons. Fleet Officer: Show a willingness to interact with the crew, both in game, and on the Forum, and help newer pirates both within the crew and outside. Candidates for Fleet must submit and application in the crew forum stating why said officer would make a good Fleet Officer. Achieve Broad Experience in Battle Navigation and Treasure Haul. Fleet Officers must show loyalty to the crew, and have gained the crew's trust. Senior Officer: Senior Officers are the Captain's Advisers, and in the Captain's absence, they are responsible for running the crew. Senior Officers must have complete trust of the Captain due to the power and responsibility they wield, and all applications will be reviewed by the current Senior Officer's Board. Captain: When the 'Old Salt' is ready to pass their hat along to someone else and retire to the 'Old Captain's Home', a candidate will be approached by the Captain and offered the position. One cannot apply to become the Captain. This page was last modified on 16 November 2013, at 05:51.